There are a number of visualizations of political bloggers’ linking behavior, notably Adamic and Glance’s 2005 work that found political bloggers of one bias tend to link to others of the same bias. Also check out Linkfluence’s Presidential Watch 08 map, which indicates similar behavior. These visualizations are based on graphs of when one blog links to another. I was curious to what extent this two-community behavior occurs if you include all of the links from these blogs (such as links to news items, etc). Since I have link data for about 500 blogs from the news aggregator work, it was straightforward to visualize a projection of the bipartite blog->item graph. To classify each blog as liberal, conservative, or independent, I used a combination of the coding from Presidential Watch, Wonkosphere, and my own reading. Projection of links from political blogs to items (Oct - Nov 2008). Layout using GEM algorithm in GUESS. The visualization shows blogs as nodes. Edges represent shared links (at least 6 items must be shared before drawing an edge) and are sized based on their weight. Blue edges run between liberal blogs, red edges between conservative blogs, maroon between conservative and independent, violet blue between liberal and independent, purple between independent blogs, and orange between liberal and conservative blogs. Nodes are sized as a log of their total degree. This visualization is formatted to appear similar to the Adamic and Glance graph, though there are some important differences, principally because this graph is undirected and because I have included independent blogs in the sample. This is just a quick look, but we can see that the overall linking behavior still produces two fairly distinct communities, though a bit more connected than just the graph of blog to blog links. It’d be fun to remove the linked blog posts from this data (leaving mostly linked news items) to see if that changes the picture much. Are some media sources setting the agenda for bloggers of both parties, or are the conservative bloggers reading and reacting to one set news items and liberal bloggers reading and reacting to another? I.e., is the homophily primarily in links to opinion articles, or does it also extend to the linked news items? I’m out of time at this point in the semester, though, so that will have to wait. 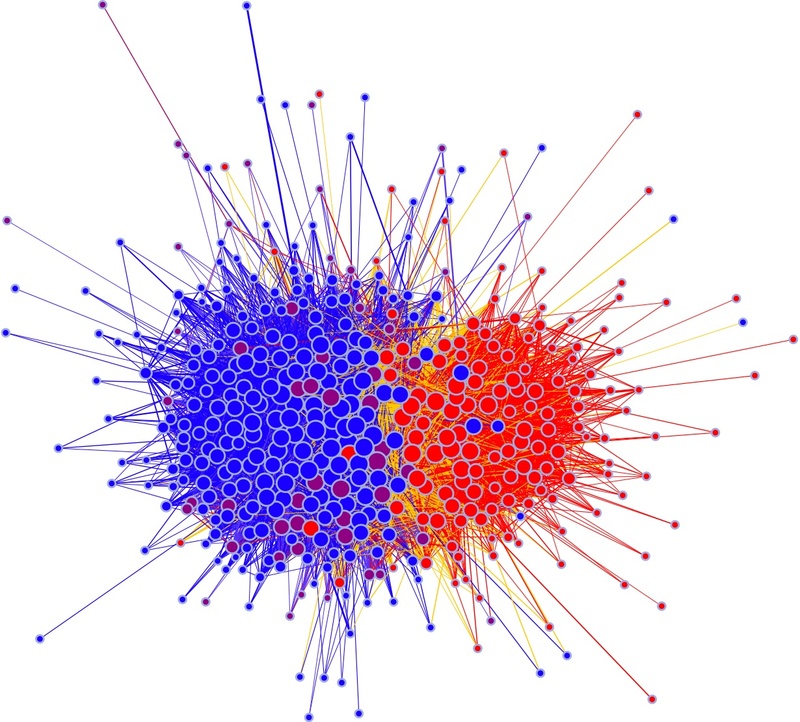 Tags: BALANCE, blogs, graph, linking, networks, politics, research, visualization. Follow any responses to this post with its comments RSS feed.